Bold and intense! Instantly lots of sherry on the nose, mixed with raisins, plums, dark cherries, dried figs and oranges. Caramelised sugar, dark chocolate, almost espresso, and subtle leather with a touch of fragrant smoke in the background. Rich and strong on the palate with hugely voluptuous sherry. Fruity sweetness of dark cherries, plums and raisins, complemented with a warming spiciness of oak, cinnamon, allspice and a hint of black pepper. Some walnut flavours emerge nicely wrapped in gentle wood smoke. The finish is medium long, warm and subtle sweet while nutty flavours, dry oak, and notes of balsamic vinegar and liquorice take over. Significantly tamed on the nose with a splash of water. Still lots of sherry, raisins and dates, while notes of dark chocolate and wood smoke are pushed in the background. Rich and creamy sweet on the palate with sherry and oranges, followed by a slightly warming spiciness of cinnamon, white pepper and lots of prickling oak. The finish shows medium length, with a subtle creamy sweetness and dry notes of prickling oak. 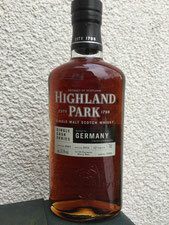 This heavily-sherried expression of Highland Park is utterly delicious. It presents the whole range of delicate flavours sherry aficionados expect from a sherry bomb. Rich, intense with the alcohol being well-integrated. However, Highland Park lovers would entirely miss the distillery character - peat smoke, citric notes and heather, which is completely masked by the sherry. A voluptuous after dinner malt though.